Whether you’re wanting to print labels for artworks or labels for artworks take the following steps. Find the artworks or client details you want to print. For clients you’ll probably want to search for people belonging to particular Lists. For Artworks it might be a collection of artworks that you need labels for. 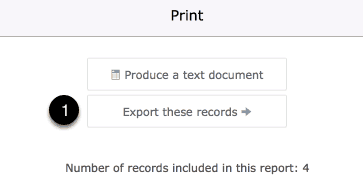 Select to print the found collection of artwork or people records. From the artwork or people component print screen you’ll be able to export the result. Select exactly the information you want to include on your labels and export the result to a spreadsheet or file format that works with your chosen label printing software. The most ubiquitous label-printing software would be MicroSoft Word for either Windows or Mac. Extensive templates and help is available to help take your export and format it as you need within this program. From the People Component access the List screen. 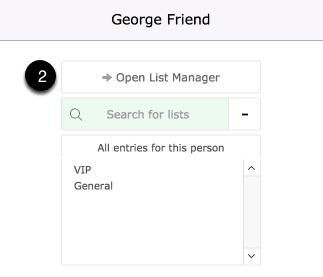 Select to open the List Manager. 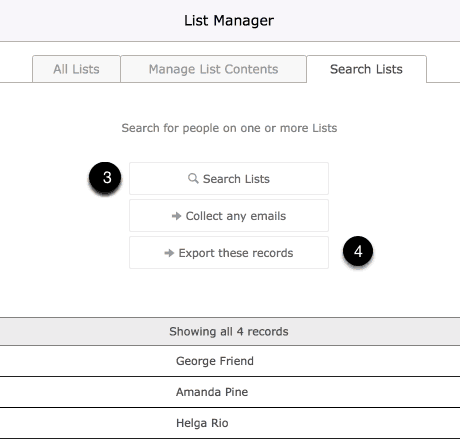 On the List Manager screen use the Search Lists function to find lists of clients.